1. The Origin of Ban xeo. 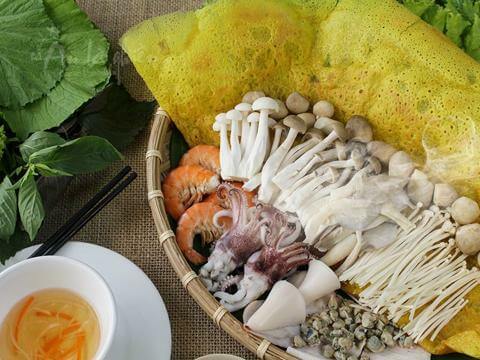 Apart from other famous foods in vietnam ,Banh xeo Vietnamese pancake also in Japan and Korea with powder outside, inside with shrimp , meat and bean sprouts. Types of Banh Xeo in South Asia. it consist of Kimchi , potato , chives and seafood.Hence the difference in the type of fillings. Shrimp , meat , cabbage is yellowed, molded into round shape or folded into a semicircle. As a result, we get to taste different taste from different countries. Depending on localities in Vietnam, the cake is enjoyed with its own characteristics. There are usually two styles: crispy pancakes and crispy pancakes. In Hue , this dish is often called a cake and is often accompanied by barbecue sauce, a sauce of soy sauce, liver, peanuts. In South Vietnam , cakes are added to eggs and people eat sweet and sour cream puff pastry. In northern Vietnam , puff pastry in addition to other ingredients such as sliced bean or sliced yam . 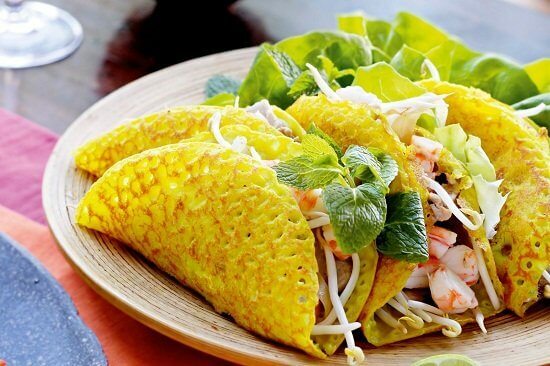 Vegetables mixed with pancakes are varied including lettuce, green cabbage, lettuce fish, perilla, basil, cinnamon leaf, young leaves … In Can Tho, there are more leaves in Dong Thap. In lam Long, there are more young mango leaves, and Bac Lieu has more leaves. 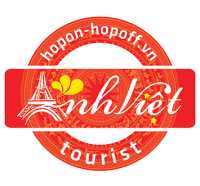 As a result, especially in areas of central Vietnam , in addition to vegetables, also added fig tart, indenture sour . 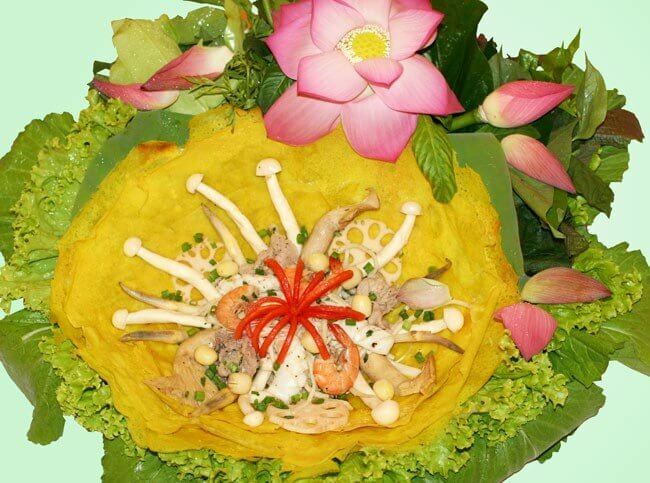 Therefore, gourmet dishes every seen vaguely like this actually stems from Hue. 2. How to prepare it. Rice flour , coconut milk , fresh turmeric , jasmine rice ( Nhen rice – a famous rice of Cambodian farmers ) soaked in water for bloom. mash the mixture of rice flour soaked with Fresh cut chopped (there are places to use stone mills to grind). after that put the dried coconut milk (dried coconut scrape the warm water in the first squeeze and then squeeze water) into the mixture with the flour is finished, about 30 minutes. Before pouring the cakes to the chopped green onion (about 5 mm) into the flour mixture, mix well. Baked meat consists of bacon (boletus), when boiling a little salt in the pot, shrimp shredded then stir fried and give a little salt with mono-sodium glutamate, green beans (some places use coconut milk, coconut is the core of young coconut, chopped). Use a large pan to fry the cake, before pouring flour into a little fat and pour even pan, then use a scoop to scoop the powder into the pan (before the powder to turn small fire, cover until the steam is ripe, then the core in the middle, cover lid Again and wait a few seconds is cooked crispy. Fish sauce with dipping sauce must use delicious fish sauce mixed with water, lemon juice, sand sugar, a little mono-sodium glutinous, carrots puree.